Or, are all of the power ports in the ford fusion hybrid only powered on when the ignition is on. I have a charger plugged into the port inside the console/armrest, and it does continue to charge for a period of time after the key is removed. Not sure how long, but it seems to be at least an hour. If the 12 volt battery is fully charged the ports stay on for about 70 minutes. The car already suffers from the 12 volt battery being discharged when the car is not driven every day. Leaving the ports on would just increase the complaint level. You could buy an external battery pack for your phone and plug it into that when out of the car. You might be able to plug the battery pack into the USB plug in the console and then the phone into the battery. This way when you shut the car off the battery would still be available for charging. As long as the battery can charge a phone while it is being charged. I have not tried this, just thought of it now. I may have to give this a try to see if it will work. Can confirm, I have a dash cam plugged into the 12V outlet underneath the MyFordTouch screen, and the charger has a light on it. The light is visible for at least an hour after I turn off the car. If I'm unlocking the car in the morning, the light is off, which means the outlet does lose power at some point. Do you always leave it plugged in? I have a dash cam as well and was worried that it would drain the battery so I started unplugging it when I park since I usually only drive 4 or 5 days a week. Yes, I always leave it plugged in. I took a 2 week vacation leaving my car at home (with the dash cam plugged in) and the battery was perfectly fine. Your 4-5 days a week is more than enough driving On my old Fusion I drove it once a week during the last 8 months of ownership (was in school) and I had a garmin GPS plugged in all the time with no problems. I know this is years later, but what kind of super genius didn't check that out before purchasing if it's so dang important? Hate to tell you this but the 12V socket has ALWAYS been a switched socket as far back as I can recall. I used to plug my CB into it in the '80s (Plymouth Sport Satellite and Fury) and it ALWAYS shut off when ignition was turned off. It would work in accessory mode, tho. My '69 Torino GT was same way as were all other cars in between these. The 12V is not immediate loss of power ... it does stay on for some time after ignition off. But if I'm charging my phone, I'm also not leaving it in the car when I exit. Therefore whether or not the socket is active is a moot point for me. Edited by Cobra348, 06 February 2017 - 11:52 AM. The 12 volt outlets shut off after about 70 minutes unless the 12 volt battery is low. In that case they shut off immediately. I'm glad that the 12 volt outlets do turn off eventually. I just got a used fusion hybrid and I want to leave the dashcam and GPS device plugged in without draining the battery. seventy minutes seems like a really long time though. Previous cars I owned turned off with the ignition key. But the next question is related to the dashcam. Looking for a way to power the thing without having the power cord dangling down across the windsheild. The cord dangling and swaying keeps catching my attention when I should be paying attention to stuff outside the car. Is there a 12 volt source up in the overhead that turns off with the ignition key and does it have enough capacity to power my car cam? Little bit of a side question, but still on topic. Which relay controls the power to the plugs? They clearly turn off at some point, and since each 12v outlet has its own 20A fuse, in theory if all 3 were heavily loaded that is 60A. I'm just curious which relay handles that? Looks like there are 2 separate relays that are non serviceable (cannot be replaced). Which means its built into the main fuse box under the hood. 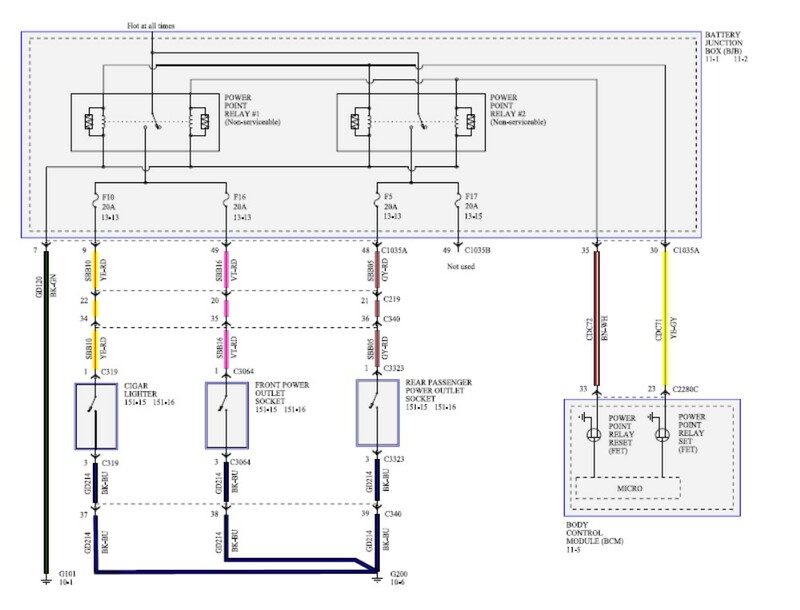 Relays are controlled by the body control module which is another fusebox/module inside the car. I added my own 12 volt power point for my 2 dashcams. I tapped into the power feed to the heated steering wheel. My car does not have a heater steering wheel but the fuse and wiring is still there. Power turns off when the ignition is off. Each dashcam only draws about 1 amp, so I used a 3 amp fuse for my added power point. The dashcam cord is tucked inside the headliner and runs down the windshield pillar trim. Its all hidden.